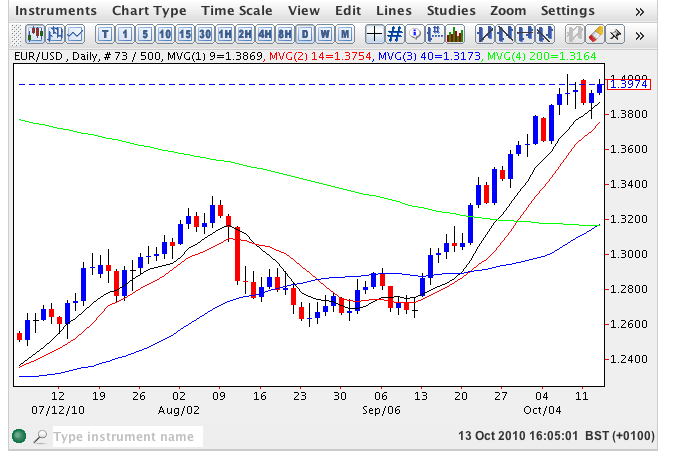 The daily chart for the euro vs dollar gave us a strong bullish signal yesterday ending the forex trading session as a narrow spread up candle but one with a deep lower shadow which confirmed once again the bullish sentiment for the euro vs dollar at present as it bounced off the 9 day moving average. This positive sentiment has also been given a further boost by the 40 day moving average crossing above the 200 day and giving us a further bullish signal. Finally, of course, the technical picture was enhanced further with the release of the FOMC minutes last night which confirmed, unequivocally, that QE2 is now imminent and, as such, we can expect a further bout of sustained dollar weakness which will convert to strength for the euro on the pair. Moreover, on the weekly chart we are currently holding above the 200 week moving average and with the test to the downside now having recovered, this is also giving us a clear bullish signal. With QE2 likely by early November expect to see the euro vs dollar test the underside at the USFD1.4217 region and any breach here should see the pair climb towards USD1.4579 and thereafter the high of late 2009 at USD1.5140. At this level the ECB will then begin to fret as it too becomes subject to pressure from European exporters, particularly Germany, and will no doubt join the rest of the world in the increasingly fractious currency wars in order to weaken the euro against other major currencies. Aside from yesterday’s release of the FOMC minutes this week’s fundamental news for the euro vs dollar is restricted level 2 data with the exception being tomorrow’s trade balance in the US along with the PPI and the weekly unemployment claims. Meanwhile in Europe we have the ECB monthly bulletin due for release tomorrow.